356 pages | 81 B/W Illus. With recent advances in computing power and the widespread availability of political choice data, such as legislative roll call and public opinion survey data, the empirical estimation of spatial models has never been easier or more popular. 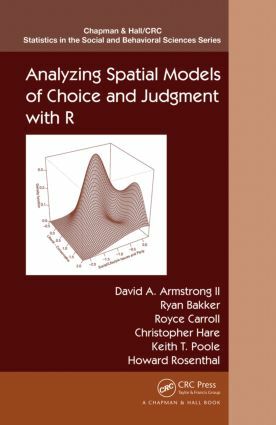 Analyzing Spatial Models of Choice and Judgment with R demonstrates how to estimate and interpret spatial models using a variety of methods with the popular, open-source programming language R.
Requiring basic knowledge of R, the book enables researchers to apply the methods to their own data. Also suitable for expert methodologists, it presents the latest methods for modeling the distances between points—not the locations of the points themselves. This distinction has important implications for understanding scaling results, particularly how uncertainty spreads throughout the entire point configuration and how results are identified. In each chapter, the authors explain the basic theory behind the spatial model, then illustrate the estimation techniques and explore their historical development, and finally discuss the advantages and limitations of the methods. They also demonstrate step by step how to implement each method using R with actual datasets. The R code and datasets are available on the book’s website. "The book is well organized. … The R code in the book is well documented and the R outputs are clearly interpreted. … The book is accessible to applied researchers who are more interested in applying the methods than in delving into their underlying theory. The step-by-step instructions given allow the reader to directly apply the methods. The understanding of the theoretical arguments, however, only requires college-level algebra." "For someone working outside of the fields of spatial modeling and political science, simple and informative plots of results are vital to understanding exactly what spatial modeling is capable of in political science. This book emphasizes this need too, and the graphics provided help to answer questions on various issues from different countries. The book provides a user-friendly chapter on R and throughout offers simple summaries of established functions, such as optimization methods, which are valuable for any R user regardless of their research focus and ability. On top of these are useful descriptions and examples of more advanced packages for spatial modeling, with printed R code and exercises for the reader. This book appears to be a great tool for established political scientists and spatial modelers, as well as those new to the fields who want to get up to speed." "Analyzing Spatial Models of Choice and Judgment with R is the rare R-instructional book that succeeds on three levels. It clearly sets forth the psychological theory underlying its modeling method. It demonstrates how the mathematics used for the modeling provide principles of construction and interpretation consistent with that theory. And, it features very well-presented and sophisticated R code—sophisticated enough to bring novice users of R very far along the path of proficiency and even enough, in some sections, to educate and challenge more advanced users. Students and practitioners interested in this field, or in latent space modeling in general, should consider it essential reading."